Tom Gleeson roasted Grant Denyer on Hard Chat about the Logies. Tom Gleeson just spectacularly roasted Grant Denyer ahead of the Logies. Since Grant Denyer was announced as a Gold Logie nominee just a few weeks after confirming his show Family Feud was cancelled, things have been a little awkward. After all, the award, by name is for “most popular personality on Australian television” and while that’s still technically where Denyer is, as episodes of the Channel Ten game show he hosted continue to air, it’s axing certainly makes things less than ideal. We’ve all been thinking this, but Hard Chat host Tom Gleeson has decided to say it, even addressing the issue with the man himself on TV this week. Denyer was a guest on the comedian’s Hard Chat segment of the ABC’s The Weekly with Charlie Pickering and, as we’ve become accustomed to, did not hold back. Again Denyer handled the dig well, joining in on making fun of the show, which he confirmed in early May was wrapping up – just under three weeks before the Logie nominations were announced on May 27. 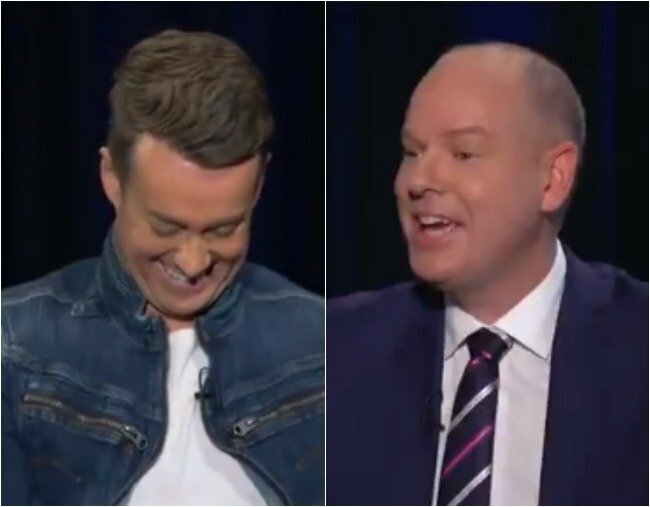 Gleeson presented his best burn yet with: “Was it hard to do a survey of 100 people when even 100 people weren’t watching?” To which Denyer could only muster a laugh. The pair then discussed who should win the Gold Logie of nominees Tracy Grimshaw, Rodger Corser, Andrew Winter, Jessica Marais, Amanda Keller and Denyer. The former racing driver told Gleeson he thought A Current Affair’s Grimshaw should take it home, but the stand-up comic disagreed. He then pledged to do his best to get Denyer the Gold Logie, which the 40-year-old seemed genuinely chuffed by. Gleeson has since launched a campaign to see Denyer take home the award on Sunday night. On Twitter, he changed his feature image to a graphic of Denyer and a Logie and has kickstarted the hashtag #Denyer4Gold – which is already gaining momentum. Gleeson also appeared on ABC’s Breakfast to talk about his ‘Grant Denyer for Gold Logie’ campaign. Australians have joined in, pledging to vote for the host, who is expected to man another Channel Ten game show later this year. Given that we’re 99 per cent sure Gleeson is the reason Sophie Monk became our Bachelorette, (watch the Hard Chat video and tell us he didn’t put the idea in her head) we think Grant Denyer should start preparing an acceptance speech.